We're in the dead of winter now, the last few days of the darkest six weeks of the year. My crank-o-meter needle is dancing on the right side of the dial (yes, it's analog). Last year Governor Christie skipped a 3.1 billion dollar payment to the pension fund, one of the few truly bipartisan acts we get these days--preceding Democratic and Republican governors had done the same for over a decade! Yesterday, on a snowy Friday when folks were busy shoveling, the NJ Senate President Stephen Sweeney, a Democrat, joined forces with Assembly Speaker Sheila Oliver, another Democrat, to announce the end of the current state pension plan. "We're blowing up the system that exists to create one that's going to eliminate politics." Those of us not yet retired, all of us, are affected. Those of us with less than 5 years of service are affected more--we will lose cost of living adjustments. Those of you retired are safe. This is the best case scenario. Sweeney and Oliver are doing this to help us. If you are looking for a teaching position in New Jersey, great news! Any rational teacher vested in the pension system has a hard decision to make. Some will stay because they love (and live) for teaching, and never planned to retire anyway. Many will need to leave because as much as they love teaching, they love the idea of eating and keeping a roof over their heads during their retirement years. I entered teaching way too late for this to be disastrous news--the newer members of the profession were already getting hammered while local unions strived to protect the dwindling benefits for their more senior members. Property taxes were already becoming unsustainable. The only thing I trust for my retirement is that the seeds will still grow, and that clams and fish will still be in the bay. I trust the laws of nature more than I trust the laws of humans. 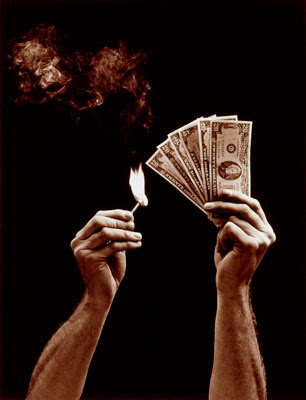 The burning money image is from Naked Capitalism. The money numbers for 2008 came from Ridgewood Views here. Should I Stager should I go?